On Tuesday, I showed you a view of the USS Abraham Lincoln from the streets of Everett. The aircraft carrier already looked big from afar, but it was even more imposing from Pier Alpha at Everett’s Naval Station, so enormous that I had trouble sizing up the proportions so it would fit on my sketchpad. It’s easy to be impressed by a ship of this caliber. Yet, what I find more interesting is the number of people who serve on it, more than 5,000. The Naval base is actually the second largest employer in the county — Boeing is the first one. A handful of civilians also come along on deployments, said public affairs officer Robyn Gerstenslager. They include a college professor who teaches classes to the crew, a Xerox technician, a fitness instructor/personal trainer and an NCIS agent. No sketchers though. I wondered if the Navy would have a program similar to the Army Art Program, but Gerstenslager said they don’t have a dedicated sailor-artist on board. That’s too bad since the opportunities to document life on the ship with sketches seem endless — I could have spend all day roaming around and drawing everything on sight. 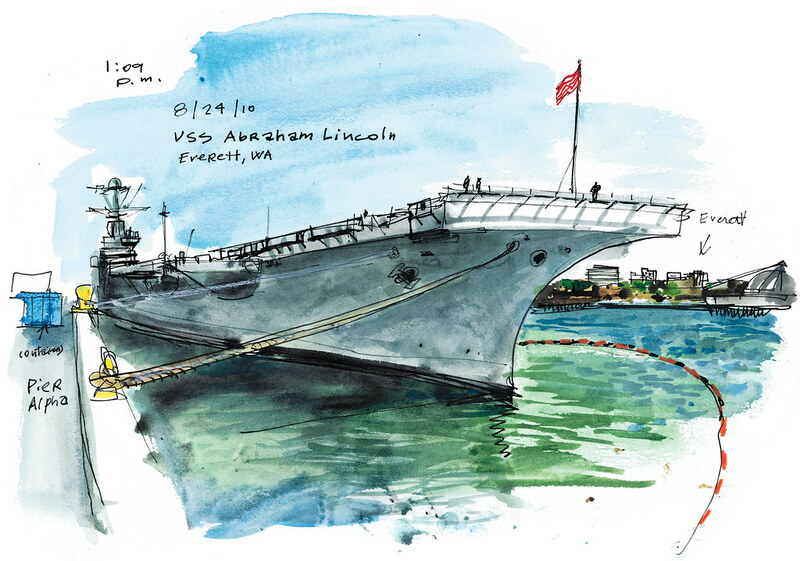 With so many sailors on board, I bet there are more than one or two drawing enthusiasts already doing that — hint: if you’re one of them, e-mail me your sketches, I’d love to see them! The number of sailors serving on the carrier made me think about all the people who have family ties to the Navy personnel. It must be hard for them to see their loved ones sail away when they go on deployment. Gerstenslager said they started a Facebook page last year to help families stay in touch with the crew. It has 10,994 fans as I type this post, a few thousand less than the USS Carl Vinson. “We are trying to see who can outdo each other,” quipped Gerstenslager, whose team of petty officers produces a newspaper and a TV show they share on the page. “Anyone who becomes a fan on Facebook can see it,” she said. I already clicked “like” and look forward to following our Puget Sound based carrier on Facebook. It’s a fact: All Navy ships fly the First Navy Jack instead of the Union Jack to honor those who died in the Sept. 11 attacks. Related story: First Navy Jack flies until the end of war.